Are you studying point of view and possibly narrative writing at the same time in your literature classroom? Maybe you would like to elevate your students' level of writing by asking them to consider a new point of view for a text? If so, this document will help you with exactly that! 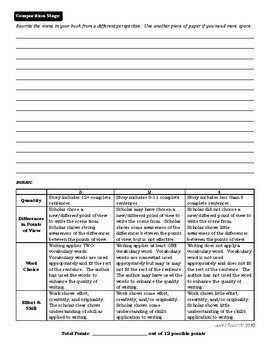 This graphic organizer will prepare your students to trace the point of view in any self-selected text and then pre-write a compose a section from their text using a new point of view. Teachers will love the built-in rubric and writing space on this product -- it's everything you need in one place for a great formative assessment piece!